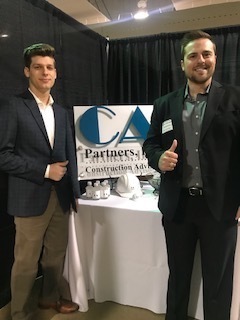 CA Partners, Inc. was one of 155 companies attending the Texas A&M University Construction Science Spring Career Fair for CIAC members and students. CIAC stands for Construction Industry Advisory Council and has become the envy of the other departments at Texas A&M. It has also become an organization which other universities in the U.S. and abroad attempt to emulate. Established in 1998, the Construction Science Department at Texas A&M University aimed to draw from the construction industry’s expertise. The non-profit organization may be endorsed by Texas A&M but it is 100% industry organized and led. CIAC’s mission is to present students with real world industry opportunities and support the faculty and students. What the industry has received in return are great candidates equipped with the knowledge and skills required in today’s construction field. Learn more about Texas A&M’s CIAC program at http://cosc.arch.tamu.edu/industry/index.html. The construction industry has dramatically changed over the last 20 years and so has CIAC. This group of industry leaders have evolved into a diverse group of construction professionals. Membership is made up of both small and large general contractors, subcontractors, developers, and service providers for both residential and commercial construction. Noteworthy is the CIAC industry members’ provision of scholarships awarded to over 200 construction science students annually. In 2017, members awarded $444,800 in scholarships. Moreover, CIAC provides a 90% career placement of Texas A&M’s construction science students in both the Fall and Spring semesters. CA Partners, Inc. hosts a booth at every CIAC career fair. While it is always nice to add additional resumes to the HR file, we consider this an opportunity to educate future construction leaders about our role in the industry. Construction consulting and advising to financial lenders is a very small, yet unique niche. We believe it is a role every construction student should be aware of whether they end up working as contractor, subcontractor, or developer. Construction consulting, at its core, is about relationships and collaboration. While CA Partners, Inc. represents financial institutions, we must communicate and work with the construction team helping find efficient and practical solutions to keep the construction project moving forward, on time, and in budget. 8 years ago I attended our first career fair. Believe it or not, I was just as nervous as the students (maybe more). I didn’t know anyone, I felt very out of place among general contractors, and couldn’t imagine students, who are being shaped specifically for general contracting, would want to know about a company that consults with lenders. Would they find our industry niche uninteresting and boring? What I find each year is a group of extremely polite, nervous, thirsty for knowledge and anxious to build and construct the next generation of buildings and homes in Texas. They are an amazing group of young men and women. Kudos to Texas A&M’s Department of Architecture and Construction Science for molding and shaping our industry’s future leaders. Without a doubt, this is my personal all-time favorite bi-annual event. I love meeting the students, informing them about lender consulting, and hopefully provide just a little bit of advice on how to prepare for the professional world in which they are about to embark. Good luck 2019 graduates and thank you Texas A&M! Whoop! Visit http://www.capartnersinc.com for products, services or to request a proposal. Copyright © 2019 CA Partners Inc.